An diugh, thàinig ar caraidean ann an clas 5 a-steach a chèilidh oirnn ‘s obraich sinn còmhla riutha air ar leabhraichean leughaidh. Tha sinn a’ leughadh ‘Montaidh aig an tràigh’ an dràsta. Dh’ aontaich sinn gur e am pàirt leis an t-siorc am pìos as fheàrr ! Ann am matamataigs, tha sinn air a bhith ag obair air arraighean a chrutachadh ‘s dh’ obraich sinn còmhla airson baile ùr a chruthachadh. Bha bhòt againn ‘s bha sinn ag iarraidh an ainm ‘Baile Tocaidhdo’ a chur air. 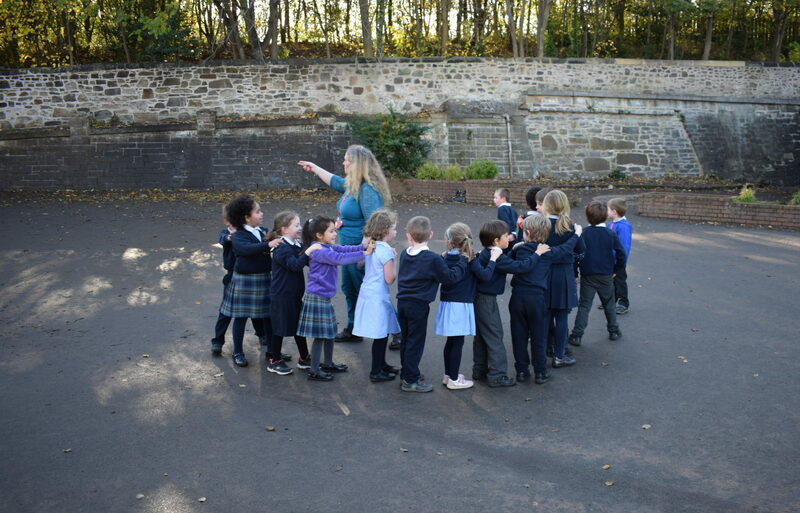 Gu h-inntinneach ann am matamataig rinn sinn grid references a bharrachd air a sin rinn sinn dealbhan mìorbhaileach le grid references. Gu spòrsail aig parkour bha sinn ag ionnsachadh seòrsa de leum le landing position gu brònach dh’fheumadh sinn dhol air ais dhan sgoil cuideachd ghabh a’ Bh-uas Hoy pàirt ann, bha i uabhasach math. Gu h-inntinneach bha sinn ag ionnsachadh ma dheidhinn cùis mhòr is cùis bheag ann an social detectives mar sin bha sinn a’ coimhead air bhideo de sanas Ameriganach ionantach is èibhinn agus bha an duine ann air stad air straidhre-gluasadach às dèidh sin bha iad an–sin fad na h-oidhche. Gu fortanach bha fhios againn gu robh dòigh nas fhasa ann a bhith a’ dèiligeadh ris, mar a bhith a’ coiseachd suas an straidhre-gluasadach. Gu sònraichte ann an fonaigs dh’ionnsaich sinn na diagrafan igh, ay agus ee mar sin bha sinn a’ cluich hangmouse inntinneach, doirbh le faclan mar fortnight.